We are well into 2018, and notable gaps have opened up in the relative performance of some major asset classes. With U.S. equities and growth, in particular, being the big winners, we explain why diversification remains as important as ever… if not more so. 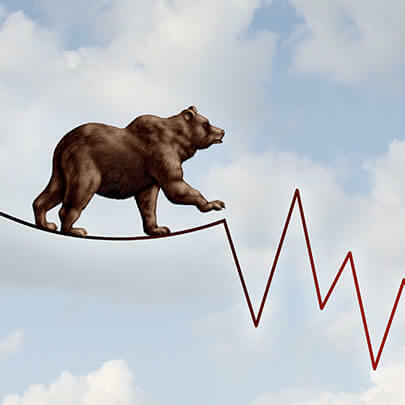 As the economy continues to hum along and the Fed, largely in response, proceeds on its path of raising interest rates, we have seen two large gaps develop. The first is between U.S. and international equities; the second is between growth and value stocks. The S&P 500 produced a total return of 7.7% in the third quarter, pushing the year-to-date total return into double digits. Helping to drive that return was another strong performance from growth stocks. Amazon (AMZN), Apple (AAPL), Microsoft (MSFT), and Netflix (NFLX) have contributed nearly half of the return of the S&P 500 year-to-date. It is common for momentum stocks to be strong late in an economic cycle, but we would caution about jumping into stocks like Amazon and Netflix where too much of their valuation is based on future speculation. Both in the third quarter and year-to-date, the gap between Growth and Value stocks has expanded (see the chart below). While Growth is the clear winner recently, historically, Value has been the better long-term performer. Growth has significantly outpaced Value, for both Large and Small Cap stocks. The strong performance of U.S. equities is even more pronounced when compared to international peers. A divide has opened between U.S. and international equities, with the U.S. significantly outperforming thanks to the advancement of the U.S. dollar in 2018 combined with relative economic strength. With international valuations improving, investors should not shy away from what has historically been a useful source of diversification. U.S. equity strength is particularly strong relative to international peers. The Fed raised interest rates again in September, marking the eighth increase since tightening began back in December 2015. One more move higher is expected before the end of the year. More notable than the raise itself was the removal of the word “accommodative” when describing the current 2.25% rate. Removing “accommodative” implies that the Fed believes rates are approaching their neutral level where monetary policy is neither providing stimulus nor applying an economic brake. That is not to say that rates will remain static in the near term. The Fed still anticipates steady tightening gradually to a rate of 3.4% in 2020. The pressure of rising rates has had two primary impacts for bonds. First, it has put downward pressure on bond prices (as rates rise, bond prices fall). But it has also made bonds (particularly short-term) more attractive to hold as an income-producing asset class. Rising rates translates to rising bond yields. Our approach is to hold shorter-term bonds, which, upon maturity, can be reinvested into likely higher-yielding bonds. The Fed expects to continue to raise rates through 2020 to 3.4%. As we discussed in our Equities section, we saw a significant divergence between U.S. and international holdings both in Q3 and year-to-date. The strong U.S. dollar and continued relative strength of the U.S. economy, compared to other developed countries, drove the split. Gold was also a casualty of the strong dollar. The best performing asset class this year has been Small Cap stocks. We continue to be tactically over-weight this segment of U.S. equities as we see smaller more U.S.-centric stocks as less impacted by global trade skirmishes, and more likely to benefit from protectionist policies, lower taxes, reduced bureaucracy, and an active mergers and acquisitions environment. With that said, the underperformance of international assets (particularly stocks) may be offering an attractive entry point into an asset class that is an essential component of a well-diversified portfolio. We touched on this subject in a recent Insights publication, “Why Own International Stocks?” In our Playbook section below, we more generally address the importance of diversification. U.S. strength offset by weakness internationally and in gold. 2018 has been all about U.S. equities. For the well-diversified investor, this could be an unnecessary source of frustration. On the one hand, you are happy that the core of your portfolio has performed well. On the other hand, your portfolio as a whole has underperformed “the market,” “the S&P,” “the Dow,” or some other U.S. equity benchmark being reported tick-by-tick on CNBC. Such is the nature of a properly diversified portfolio. In a well-diversified portfolio, there is almost always a best-performing asset that is better than the portfolio’s overall performance (though technically it is possible for the portfolio’s performance to be higher). With the strong performance of the U.S. market shining a spotlight on this dynamic, we take a moment to remind investors why diversification matters. First, let us remember why we invest. We DO NOT invest to take big speculative bets in hopes of earning outsized returns. That is called gambling. Rather, we invest in a manner consistent with our risk tolerance with the aim of achieving our long-term financial goals. Diversification is an essential tool for increasing the odds of reaching that goal. It improves risk-adjusted returns. We discuss the “magic” of diversification in “Volatility: Friend or Foe?” Proper diversification can simultaneously enhance long-term returns while reducing the ups and downs of portfolio value. There is no such thing as an investing crystal ball, but diversification is the next best thing. As we often discuss, market timing is akin to gambling (see our white paper: Market Timing: Investing or Gambling?). With a diversified portfolio, rebalancing to underperforming assets automatically rotates into assets that are likely better value, and could offer more future opportunity. The “quilt” below shows how the performance of a diversified portfolio might compare to the assets that make it up. Investors may be cursing the decline in Emerging Markets this year, but let us not forget that they were up nearly 40% last year! Would an investor have earned more putting all of their money in Large Cap U.S. stocks over the past year? Absolutely, but at significant risk. The sample “Asset Allocation” portfolio in the quilt had slightly lower annual returns than U.S. Large Cap, but had dramatically lower risk. A diversified portfolio has provided good returns at much lower risk. Avoid chasing outperforming assets and securities (namely U.S. growth). Keep fixed income exposure short-term to enable maturing bonds to roll into higher yielding replacements. Maintain an overweight in Small-Cap U.S. stocks which, despite their strong performance this year, will likely continue to benefit from tax reform and protectionist policies and are potential targets with merger and acquisition activity high. Top up on international holdings that have underperformed this year. The Strategic team would like to thank all of our clients for your confidence and input. We look forward to wrapping up another year with you!